The fitness trainer is now becoming accepted as a necessary member of the modern coaching team. This new coaching model has the Head Coach leading a team of specialist coaches, therapists and sports scientists. For example, the head coach is accompanied by a secondary technical coach, a physiotherapist, a psychologist, a fitness trainer and a physiologist, with each performing their specified role, but communicating and working as a team. For elite sports, the trainer should be able to design workouts that cover all relevant fitness areas - strength, flexibility, agility, aerobic and anaerobic endurance and speed. These workouts must be both specific to the sport and suitable for the level of the athlete. In addition, the trainer should be able to assess fitness levels, understand physiological and biomechanical test data, liaise with physiotherapists regarding injury prevention and rehabilitation and also be able to pass on sound nutritional instruction. This job description, if carried out to full capacity, requires a great deal of expertise and experience and is likely to be beyond the knowledge base of most head coaches. Thus, the advantage of using a specialist fitness trainer is that he or she has the specific skills, experience and time to optimize the physical preparation of the athlete. The purpose of this presentation is to explain the principles behind designing a sports specific fitness program and describe some of the important training methods that should be employed. Specifically I will discuss fitness assessment procedures, analysis of the fitness demands of a sport, strength and power training, balance and stability training, endurance training and speed and agility training. The principles behind designing sports training programs are analogous to the methods used by corporate management consultancy firms. When asked to provide a business solution, a management consultancy firm will begin by establishing the goal the client wants to achieve. They then assess the client&apos;s current status, systems, markets, etc. The final step is to calculate what is required to bridge the gap between the client&apos;s current status, and what they need to achieve their business goal. This final step is called gap analysis. The plan they implement is based completely on the outcome of the gap analysis. This gap analysis model is exactly how a sports fitness program should be designed. Step 1 is to set the athlete&apos;s or team&apos;s goals - what do they want to achieve. Step 2 is to assess the athlete&apos;s or team&apos;s current level of fitness. This assessment must cover all the relevant fitness areas specific to their sport or event. Step 3 is the gap analysis, which is calculating the difference for each fitness component between the current and ideal fitness levels. Finally, Step 4 is designing the training program that will improve each respective fitness area to the required level. This Example Should Clarify The Situation. Male 19 year-old national tennis player. 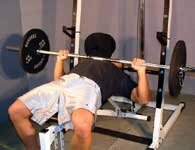 Some weight training experience and completes regular cycling and treadmill workouts. Become a professional player on tour. Aerobic fitness is pretty good, not far off ideal. All the sprint, agility and leg power tests are below ideal. Especially, the standing broad jump test, suggesting that leg power could be improved. Arm power is fine and therefore needs only to be maintained. The player has a six-week period of no competitive tennis and so we will devise a plan to improve leg power and agility for this period, while maintaining upper body strength and aerobic fitness. Monday Frappier drills, Squat jumps, Standing long jumps, Hexagon drill, Lateral hops. Tuesday Resisted sprints, 10 x T drill, 2 mins rest. Power cleans, Squats, leg curls, power lunges, medicine ball for upper body and trunk. 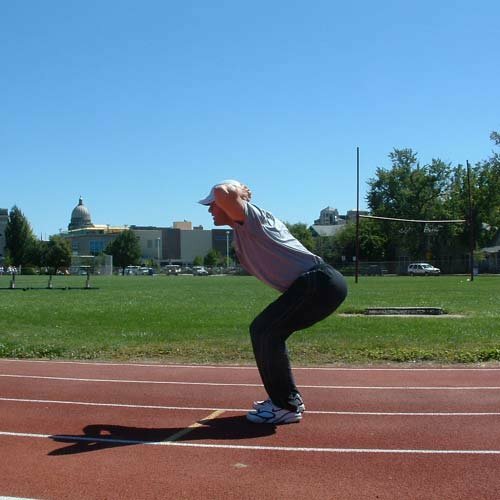 In the early 1980&apos;s an Exercise Physiologist from Kansas State University named John Frappier came back to the U.S. from Europe having studied speed and agility training programs of the former Soviet Union. He became convinced that there were external ways which athletes could train which would stimulate the body&apos;s muscles, neurophysiological, and skeletal systems to perform more quickly, powerfully and with extended intensity. This acceleration program and their drills have become known in athletic development and training circles as "Frappier Drills". The progression over six weeks would be to increase the intensity of the plyometric drills and the weight lifted in the gym - e.g. replace squat jumps with drop jumps into lateral sprint. By the end of the six week period the player would be re-tested and hopefully we would see improvements in 30m sprint, standing long jump test and 20m shuttle run test. Here is a selection of fitness assessments that cover all aspects of physical performance. For each athlete or team one should select a few relevant tests, using this list as a guide. Estimates aerobic power or VO2max, in ml/kg/min. Very good for games players as it is specific to the nature of their sport. Not suitable for rowers, swimmers or cyclists as they will achieve higher scores on specific tests. Also, endurance athletes may have trouble with short turns. The Cooper test is an alternative test for aerobic fitness. It is simple, being the maximum distance run in 12 mins. Click Here For The VO2 Max Calculator. This is a test of intermediate anaerobic power, i.e. the lactate system. It is performed as a shuttle run over 25 yards (300 = 12 x 25 ). This is a good test for games players as the shuttle format makes it sport specific. Especially for football, rugby, hockey, basketball and squash. This is a test of agility. It involves running forward 10 yards, side-stepping left 5 yards touching a cone, side stepping right 10 yards touching a cone, side-stepping back 5 yards and running backward 10 yards to the start. This is classic test for tennis, squash or football, which involve multidirectional movement. Another test of agility but a more simple drill involving only sprinting and turning. Good for rugby, football, tennis and all games. The athlete starts in the middle cone, sprints 5 meters to the left, touches the far cone, turns, sprints 10 meters across to far cone, touches and sprints back to the middle. Test of maximum sprint speed are essential for most sports. The distance chosen may vary for different sports. For instance, in tennis - 5m and 20m useful for assessing initial acceleration, For a rugby back, 60m may be more appropriate for assessing max speed. A test of maximum anaerobic power (leg). Functional test for initial acceleration and horizontal power. Good for sprinters, tennis, rugby, hockey, football, fencing. Good scores are 2.50 - 3.30m (male), 2.3 - 3.0m (female). A test of maximum anaerobic power (leg). Probably the most widespread test used to test leg power. Considered functional. 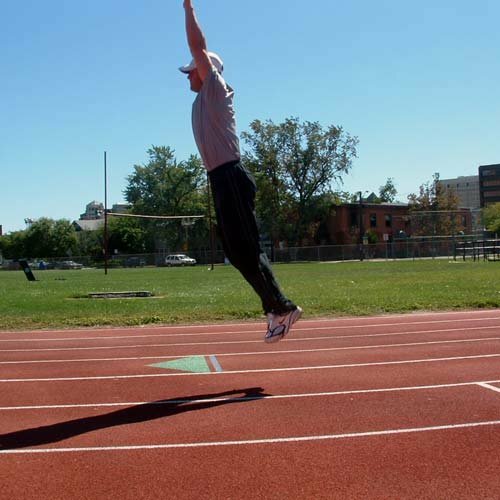 Athlete performs a counter movement jump using the arms and touches with one arm as high as possible. This is a functional vertical power test. Suitable for basketball, football (center back, keepers, strikers), volleyball, tennis serve, rugby. Good score: 55 - 70 cm (male). A further max anaerobic power test (leg). Athlete drops off a bench and instantly rebounds and performs a maximum vertical jump. The score is the maximum drop height at which the athlete can still achieve the same score as on the vertical jump. 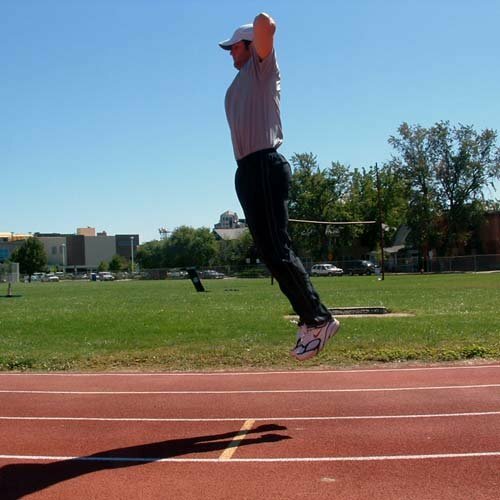 This is a measure of the athlete&apos;s plyometric (SSC) power. Anything less than 18 inches suggests that SSC exercises for RFD are a priority. A test of upper body power. The athlete performs the equivalent of a football throw-in with no run-up. 2 - 5 kg ball is suitable for most sports. This is a test of upper-body strength. Correct form is important and must be monitored for a correct test score. For men >45 is excellent, women >30 is excellent. For men <20 is poor, women <8 is poor. This is a measure of trunk strength endurance. The athlete performs as many full sit-ups as possible in 1 minute with his/her feet held. Good scores are 60 for men and 50 for women. Poor scores are 38 for men, 30 for women. 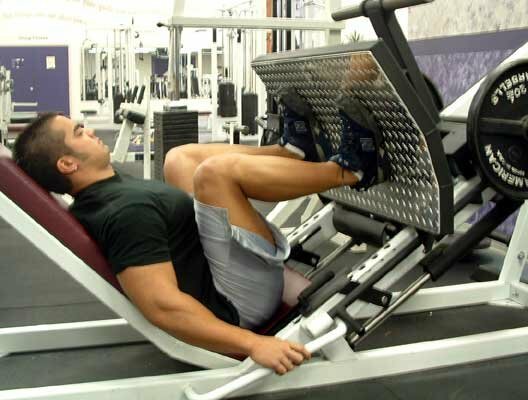 Maximum leg strength test. Considered the most functional of leg strength tests in predicting sprinting and jumping ability. Elite athletes can achieve 2 x BW (male) and 1.5 x BW (female). 1 RM can be estimated from formula 1 RM = wt x (1 + 0.0333 x reps). Maximum leg strength test. A useful test as no technique or prior experience is required; however, it is not as functional as the squat. The recommended guideline is that athletes should be able to push >2.5 x BW. Maximum upper body strength test. The need for maximum upper body strength varies between sports and so it does not always need to be tested. For example, in football a basic upper body strength will suffice but in rugby max upper body strength should be developed. Good scores are 1.25 x BW (male) and 0.8 x BW (female). 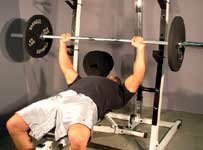 Enter the amount of weight you lifted and the number of reps you lifted it for (the number of reps must be between 1 and 10 in order for the calculation to work). Your One Rep Max will appear at the top and all your percentages will appear below it. This is an important test because it relates directly to an athlete&apos;s fitness. It can be measured by skin fold formulas or by bio-impedance machines. Too much body fat means aerobic training and nutrition need to be prioritized. Remember: Athletes only need to eat a low-fat diet to be lean - not a low-calorie diet. Be careful that the test is accurate and that you can trust it; otherwise you could be boosting aerobic training and changing diets for no good reason. A body-fat score can be highly motivational; you do not want to invoke misplaced changes in eating habits. Typical scores for athletes are 6-12% for men and 12-20% for women. All the tests above are easily accessible and will provide the trainer with the information they need to design the training program. However, you do not need to use them all. Select only those which are relevant to the athletes&apos; sport. Sometimes we can be tempted to use a test because it is popular or because there is data available. For instance, quads/hams isokinetic ratios or lactate profile test in lab. Remember to always question exactly what the test is telling you. Make up your own tests. Sometimes it does not matter if no one else uses it, if it is relevant to the athlete and you see the progression. The assessment results are analyzed to establish which fitness areas need to be developed to raise competitive performance. The design of the training program should prioritize these areas to bring them up to scratch. The fitness areas which are already good can simply be maintained. This principle recognizes the fact that it is difficult to develop all aspects of physical performance at once. This is both because of practical issues - there may be simply a lack of time to work on all areas during the training week - and physiological issues, in that strength and power development is compromised by endurance training. The following sections will briefly describe appropriate training methods and their dosage for each of the fitness aspects. At some stage every athlete needs to develop strength and power. The best results are achieved with 2-4 times a week training, with little concurrent endurance training. In competitive periods, this is not practical for many sports although research has shown strength maintenance and sometimes improvements are possible through a season with regular strength training. The best solution is for strength and power development to be planned for the off season and then maintained through the season. 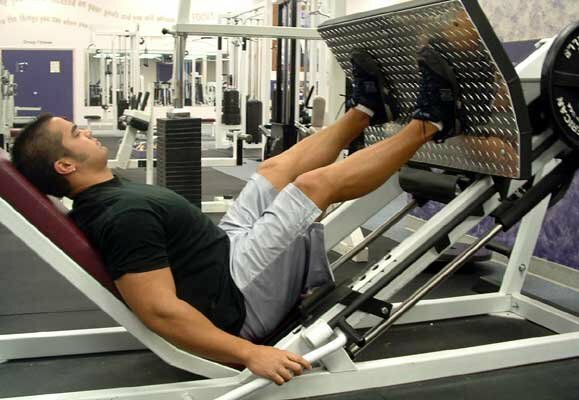 To develop max strength, a weights exercise session should be designed. A typical session comprises 5-10 exercises with 2-4 sets of 5-12 RM per exercise. To develop power, plyometric exercises are most commonly used. A session comprises 5-8 exercises with a total of 100 - 300 foot/shoulder contacts per workout, depending on the athlete&apos;s level and time of year. Weights and plyometric exercises can be combined in the same session. This is called complex training and is very effective for peaking (see also PP, issue 114, February 1999). Always choose weights and plyometric exercises that are functional to the sport or movement. For example, squats and drop jumps are better for vertical jumping ability than power lunges and standing long jumps, which are better for horizontal jumping or sprints. For another example, choose free weights instead of machines as synergistic muscles are involved to stabilize. Think about the type of contractions involved in the sports movements, e.g. hamstrings&apos; eccentric function, the joint angle and the speeds of movements. The more specific the exercise, in all aspects, the greater the crossover into performance. Sometimes upper body strength is incorrectly over-emphasized. For instance, in tennis upper body power training is more important, as a racquet only weighs 400 grams. If your 1 RM squat is not significantly more than your 1 RM bench press, then you have been doing too much upper body work in the gym. Aerobic fitness is primary for most sports. However, it is not the only fitness area and if it is focused on too much can be detrimental to strength and power - which are equally, if not more important, in many sports. Trainers must think carefully about the fitness level they believe is appropriate for peak performance and then achieve that. For example, in elite football a high aerobic capacity is key, but for volleyball, a moderate level will suffice. For most games, aerobic fitness governs how quickly one recovers between high intensity sections, and how much distance can be covered in a game. 4-6 x 2-5 minutes with 2-5 minutes rest. Proven to be very effective for boosting VO2 max when performed once/twice a week. 20 x 200m with 30 seconds recovery or 10 x 400m with 60-90 seconds recovery. 5 - 10km steady runs. The advantage of using interval sessions is that the athlete always runs fast, and the volume of training is kept low. This should help reduce interference with strength and power development. The advantage of steady runs is that they take less recovery time, and are not as psychologically demanding. To develop aerobic fitness perform session a & b once a week plus two or three steady runs. To maintain aerobic training, perform either sessions a or b once a week. Anaerobic endurance is also important for many sports. This is the ability to work at a high intensity repeatedly. Both the lactate system and the ATP-PC system should be trained, but targeted in the correct proportions for each sport. For instance, tennis focuses almost solely on the ATP-PC system, due to short-burst and frequent-rest play pattern, whereas squash requires significant lactate system training as it much more continuous. Anaerobic endurance can be developed with 2-3 times a week training. 3 x 10 x 30 m sprints starting every 30 seconds. 5 minutes between sets. 15 x 60 m with 1 minutes rest. 20 x 20m shuttle run, 45 seconds rest. 5-8 x 300m fast, with 45 seconds rest until pace significantly slows. 150m intervals at 400m pace, with 20 seconds rest until pace significantly slows. 8 x 300 m, 3 minutes rest (lactate recovery training). Some aerobic benefit will also be gained from these sessions. Full anaerobic training should not take place with full aerobic training as well: one or the other must be prioritized. Speed and agility are key to many sports but often in different ways, each sport having its own particular demands. For instance, fencing requires quick footwork and acceleration but all movements are linear - forward and backward. In contrast, racquet sports are all multi-directional, with as much lateral movement as linear. In addition, different sports have different speed profiles. Racquet sports require fast off the mark acceleration, but maximum speed over a longer sprint 30-60 m is less important. Rugby and football require both good acceleration and maximum speed. Therefore max speed and acceleration need to be differentiated in training. All max leg strength exercises improve acceleration, as do leg plyometric exercises. Particularly useful ones are standing long jump, standing triple jump, hurdle hops and combination jumps (horizontal). Sprint starts. For example, 20 x 5 m with 30 seconds recovery. These can be made more specific by incorporating reactions to signals (e.g. the ball) or starting from various positions (e.g. the floor). Foot speed drills. For instance, frappier drills, complete max number of foot contacts in 10 secs. Resisted accelerations. Athlete performs max 10m efforts with trainer pulling with tubing. Very useful as it is a completely specific way to add resistance sprint start movement. However, must not be overdone as athlete can learn to run with slow cadence. Always finish workout with normal accelerations. Hill sprints. 10% gradient up and down. Overspeed running. 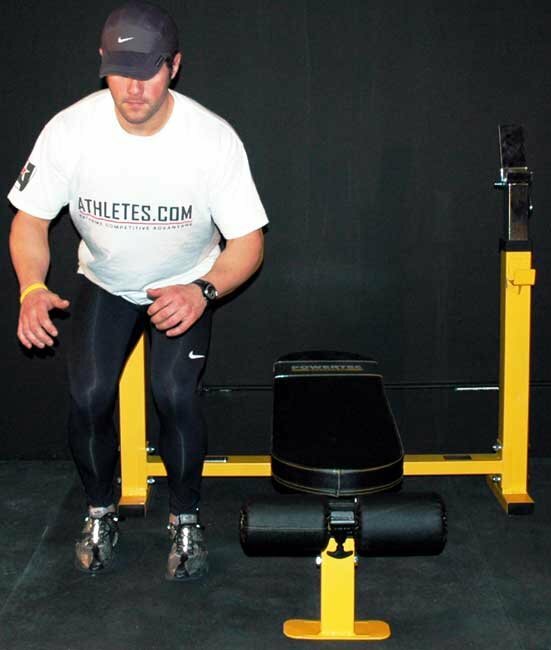 For advanced athletes only but very effective for improving leg speed. Athlete sprints while being towed by tubing or machine. Sprint drills. There is a whole repertoire of these used worldwide by athletics coaches. If used regularly they are very effective at improving running technique, coordination and stability of synergistic muscles involved in running. For instance, the walking drill. Sprint workout. A typical sprint workout could be 5 - 10 x 30 - 80 m max efforts. 3-5 minutes rest in between. Athletes must always be completely fresh for speed training if it is to be effective. Therefore, no heavy weight training or hard endurance training the day before. Speed training sessions must always include long rest periods and focus solely on quality. Speed development is about teaching the neuromuscular system to operate at full speed and power and this is not possible if there is any fatigue. 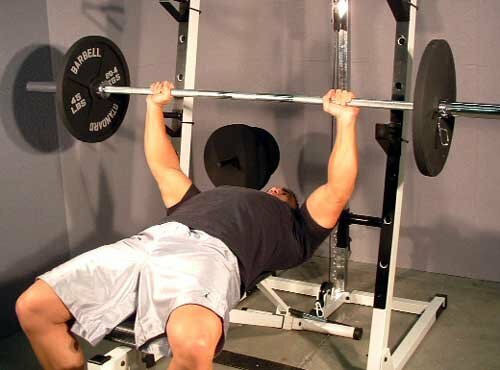 If rests are too short, the training will only develop speed endurance and not maximum speed. Agility plyometrics. Certain plyometric exercises have an agility component in them. For example, lateral hops, depth jump and 180 turn, line hopping. Customize your plyometric sessions to include exercises that target particular agility requirements of your sport. For example, depth jump and turn would be ideal for basketball. Footwork ladder. Ladder drills are great for foot speed and agility as the ladder forces precision and speed of movement. Agility drills and shuttles. A regular workout should be performed including lateral shuffle, crossovers, back stepping etc. plus shuttle runs and drills which involve turning, e.g. the T-drill. Focus on quality movement and technique to increase the athlete&apos;s agility and grace. These drills can be customized and made more sports-specific once the athlete has mastered the basics. For example, add catching a ball into the drill. A final area that must be incorporated into a sports training program is balance, coordination and stability training. Economy of movement, peak power and agility cannot be optimized unless the athlete has highly developed balance and stability. Balance and coordination have to be developed through many different methods, as variety is key. Exercises on the wobble board and balance beam are great for this. With a little imagination one can think of many things to challenge an athlete&apos;s balance and coordination. For instance, balancing on a wobble board while juggling. Stability, especially in the trunk, must also be developed through various methods. I recommend using gymnastic balls, learning some Tai Chi moves (right), as well as using a medicine ball for the stomach and low back exercises. Particularly effective are static bridging exercises, e.g. 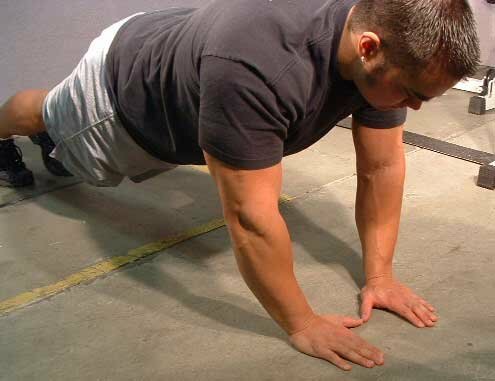 The Plank, for developing functional core stability. A stability workout should be performed at least twice a week. The most widely known form of Chinese exercise. A soft martial art or physical meditation art which uses posture, slow movement and breathing to harmonize and energize. 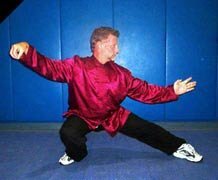 Learn more about Tai Chi in T&apos;ai Chi Magazine.